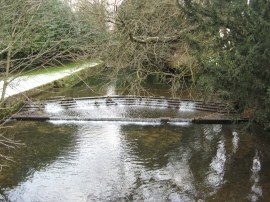 I did this walk on Wednesday 1st December 2010. I had been going to do this walk the day before but the roads had been too snowy to drive up safely. 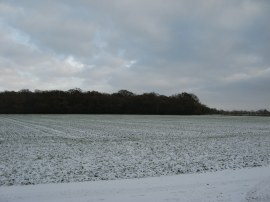 They had now cleared however it was another cold, grey day with plenty of snow still on the ground. There was also a very strong wind blowing from the north east which was particularly chilling. This is the penultimate stage of my walk round the Harcamlow Way and I parked at Standon before heading back up towards the Warren to resume my walk. 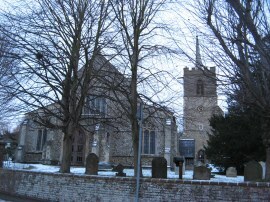 From my parking place by Standon Church, photo 1, I headed down Standon High Street to the A120. On the way I passed a number of nice shops, a traditional butchers, and a very well stocked bakery. At the end of the High Street I headed to my left for a short distance, crossing over the River Rib, photo 2, before heading to the right along Station Road. At the entrance to a doctors surgery I turned sharp right, heading along a short section of track that leads to a footpath where I turned to the left. 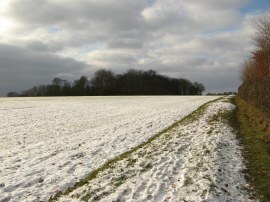 This soon leads out to a field edge path where the footpath turns left and then heads along side the field with a school playground to the left. Just past the school buildings the course of an old railway line, which I was to meet up with at several other points during the day, (which one) soon becomes evident, running in a small cutting parallel to the path. Leaving the field, the path continues ahead through some low trees running besides the river Rib for a short distance before joining the course of the old railway line itself as it heads over a small field. The railway used to run as branch line between St Margaret's and Buntingford and was closed in the mid 60's. Reaching a drive way I joined a footpath that headed to the right, crossing a bridge over the river, photo 3. The path then continues past the front of a house and a pond before heading to the right along a footpath that runs along the edge of a field. Reaching the end of the field the route continues ahead for a few yards further to join a farm track where the path heads to the left. This starts heading gently uphill along the edge of a field. Reaching a corner in the field, photo 4, where the hedge bends round to the left, the footpath I was following bears to the right, heading uphill over the field towards the trees of Darnley Wood. 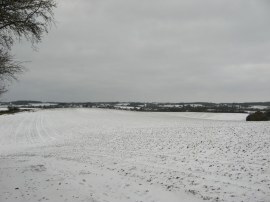 The ploughed surface of the field was frozen solid and very uneven to walk over as I made my way over to the farm track that runs down from the Warren to the point where I had finished the last stage of my walk along the Harcamlow Way some three days earlier, photo 5. Reaching this point I had walked 2.15 miles from my parking spot in Standon. Back on the Harcamlow Way I then headed downhill along the track, with trees to my right. Where these end the route continues ahead along a signposted bridleway that runs to the right of a hedge which gradually curves round to the right along the edge of the field. Reaching a corner in the field the route heads to the left across a drainage ditch and follows an almost tunnel like hedge lined footpath that heads uphill between the fields, photo 6. 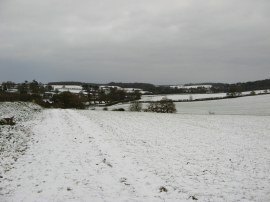 This path is followed for some distance as it starts heading downhill with the houses of Standon visible away to the right across a field. Nearing a road the route bends to the right to join the A120 Stortford Road on the edge of Standon. Here the route heads to the right along the main road for a short distance before crossing the road and heading to the left up Half Acres. 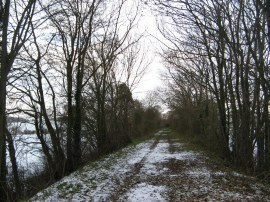 The path heads uphill past a few houses before joining a broad hedge lined track running between fields. 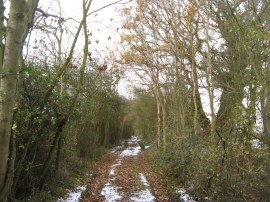 This path gradually becomes narrower as it continues ahead to reach Hadham Road where the Harcamlow Way turns to the right along the Hadham Road. Reaching the top of Standon High Street the route then bears to the left along Paper Mill Lane, passing the Standon Pudding Stone, photo 7. Hertfordshire Puddingstone is a conglomerate of very well rounded flint pebbles, embedded in a matrix of fine pale coloured sand, all bound together by hard natural silica cement. 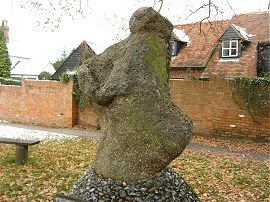 The Standon Puddingstone sits under an oak tree planted in 1911 to commemorate the coronation of King George V and to me looks almost like a carved figure although apparently the stone is natural. Heading down Paper Mill Lane the route crosses what was clearly once the course of the old railway before continuing ahead towards a ford, photo 8, where the route joins a footpath on the left that runs across a grassy field, running parallel with the river Rib. Leaving the field edge meadow the path heads through a metal gate and joins a bridleway that continues ahead, running alongside the edge of a field. 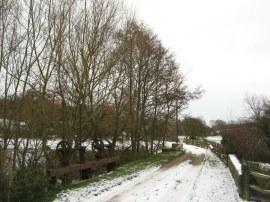 The route follows the bridleway up over a small hill before descending down the other side, photo 9, to rejoin the course of the river, by Latchford. 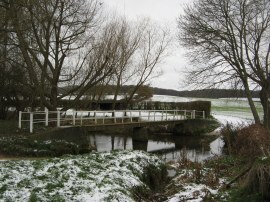 Here the Harcamlow Way continues ahead along a road, passing a small footbridge over the river, photo 10, and reaching a road junction bears round to the right. 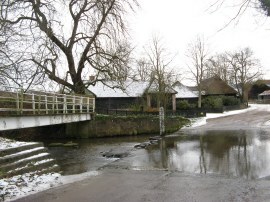 The route then continues ahead by the entrance to Arches Hall, the road now running alongside the river again. Reaching the end of the tarmac it heads to the left along a footpath which was sign posted to Barwick. 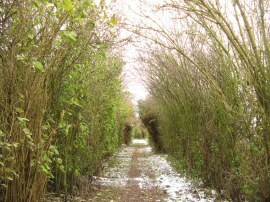 This path runs along the edge of a field with a hedge to the left. Reaching the end of the field the footpath continues winding its way ahead through a patch of scrubby woodland, the path still running more or less besides the river Rib. Leaving the trees the route continues ahead along a farm track running alongside the edge of a hill, the track bending down to the right to join a road where the Harcamlow Way heads right. Heading down the road the route soon reaches another ford over the river Rib, photo 11, at Barwick where fortunately there was also a nice high footbridge for pedestrians to use. Once over the river the route continues ahead along a bridleway that runs up between the buildings of Great Barwick Manor. At the end of the buildings the route then turns to the left along a farm track running alongside a field. Reaching the end of the field the bridleway turns to the right, heading uphill alongside a field, passing a couple of nicely located wooden benches. However although it was about time for a snack stop the weather conditions, with the strong wind blowing from the north east, made it far to chilly to stop and make use of them even. The path heads up besides the edge of some the trees of Tyler's Hill before bending round to the left where I did make use of the shelter they provided for a quick drinks stop. Although I was feeling quite thirsty I was finding it hard to drink the cold water from my water bottles so had a quick tea from my thermos flask although this took a while to cool down and I soon began to feel chilly standing around. Back on the move I followed the bridleway along a field edge path heading uphill to reach the hilltop. As I was walking this stretch of path the sun briefly broke through the clouds before disappearing once again behind the clouds which remained for the rest of the day, photo 12. Bearing to the right the route heads towards the trees of Round Wood. 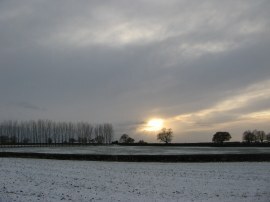 The path then follows the edge of the trees, photo 13, round to the left, running alongside a small aerodrome where there three light aircraft parked outside a hanger. 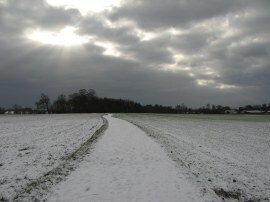 The path then follows a good track over the top of the hill with trees to the left before crossing over the middle of two fields where there were good views across the snowy landscape, photo 14. To my right I spotted a hare running across the field besides me. Reaching the buildings of Home Farm the route heads to the left along a farm track that starts heading downhill along the field edge. Reaching a gate at the end of the field I once again managed to go off route, continuing ahead through a gate when I should have followed the field edge round to the left for a short distance. For this walk I had put the route into my GPS, as well as carrying my map in my hand, but the path ahead looked so obvious that I did not bother checking either till a quarter of a mile down the path. 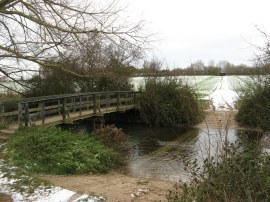 It was a pleasant detour, crossing two wooden bridges over the Rib, however as it was not the correct path I retraced my steps back through the gate and rejoined the Harcamlow Way as it heads left and then right downhill along the field edge to reach a footbridge over the river Rib, photo 15. Here I crossed over the route of the Hertfordshire Way before heading up along a track running between fields. 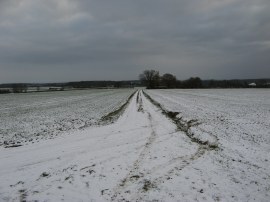 At the end of the field the route turns to the left along, given the weather conditions, the aptly named Cold Christmas Lane which is followed for a short distance, before heading to the right along a bridleway sign posted "Ware 2 miles". 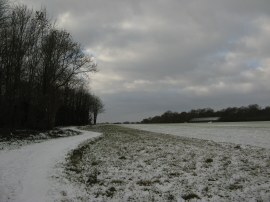 The path heads uphill along a field edge before crossing across the middle of the next field over the top of a hill along a track that runs a little to the left of the course of the footpath as marked on the map. Heading across this field the path soon reaches a junction of tracks, photo 16, where I finished this stage of my walk along the Harcamlow Way for the day having walked another 6.5 miles along the path. For much of the day the wind had been behind me but as I turned to my left to start heading back to the car it was now blowing directly in my face and with the path heading across the top of a broad hilltop there was little to break up the wind making it very cold and exposed. 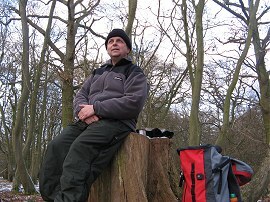 I followed a path that wound its way towards the south side of Buckney Wood, photo 17, where the trees provided some decent shelter and I stopped for a short break by a convenient tree stump, photo 18. Here I had the brainwave of mixing my cold water with the hot tea from my flask to get an instantly drinkable warm drink. Despite the cold I had been feeling a bit dehydrated and managed to drink the entire 1ltr contents of my flask which soon had me feeling much warmer. While I was having my break two big military helicopters flew over which is not something I see that often in this part of the world. 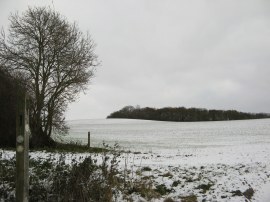 After my short break in the trees, I continued ahead along the edge of the wood before turning to the left through a small band of trees, where once again I briefly linked up the route of the Hertfordshire Way. Continuing ahead, I then headed along a field edge path before turning right by a house to join a tarmac road at Bakers End. 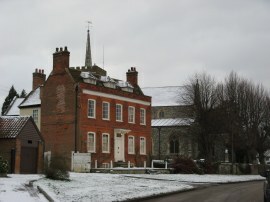 Reaching a road junction I turned to left and then immediately left again along a byway that heads past the front of an attractive timber clad house. On the other side of the road by some stables there was a peacock strutting around by the road. 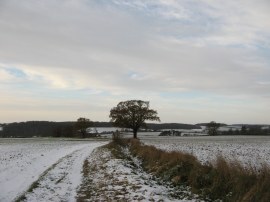 The tree lined byway, photo 19, makes its way gently uphill to eventually reach a road. Here I again headed to the left before turning to the right at the next road junction. I headed along this road up to a T junction where I continued ahead along the snow covered driveway that leads up to Biggin's Farm. 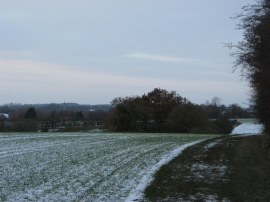 The route heads between the barns of the farm yard before continuing ahead along a field edge path. This runs round the side of a couple of fields, photo 20, before crossing over the middle of another small section of field. Reaching the other side, I headed to the left along the farm track which heads gently downhill between fields. 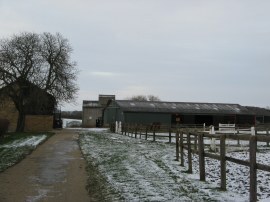 The farm track is followed as it heads round to the right between two open fields before joining a concrete track that passes through a white gate and continues ahead to the farm buildings by Arches Hall Stud Farm, photo 21. Heading between the farm buildings my route then headed to the right along a farm track sign posted "Standon 2 miles". All day to the east there had been a much thicker band of cloud although this never came over to where I was and as the sun started to lower it once again tried ot break through the cloud, photo 22. Reaching the end of this hedge lined track the route crosses over the middle of another small field before turning left along a path that runs along the route of the old Buntingford Branch line, photo 23. At the end of the walkable section of the old railway I turned to the right along a track that runs uphill alongside a field with trees to the left. Where the hedge on the left ends my route joins a field edge footpath heading to the left, photo 24. Away to my left was the valley of the river Rib which I had walked along the bottom of earlier in the day and ahead of me in the distance I could see the spire of St Mary's church in Standon which marked the end point of my walk. Reaching the bottom edge of this field the footpath headed to the left along the field edge before turning to the right through a patch of trees close to a rather smelly sewage farm. Leaving the trees the path joins a concrete track running alongside a field that runs down to join the Hadham Road on the edge of Standon from where it was just a short walk down the road to my parking spot by the church, photo 25. Back at the car I had walked 14.8 miles. Despite the weather this had been a very pleasant walk along the valley of the river Rib which made a change from the generally arable fields of the previous couple of stages. There was also a certain satisfaction to be able to get a decent walk completed on such a short, cold grey day. I now just have the final six or so miles of the path left to walk. 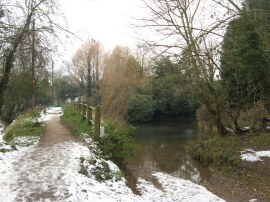 I have uploaded the route of the walk which can be accessed here Harcamlow Way 16 Route.